WIN a doodle by Liz Pichon, €1000 in books for your school and more! WIN a set of Dog Man books and your very own camera! Get your FREE entry to a choice of three top attractions!. 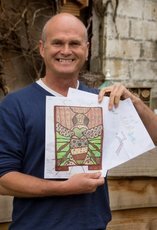 In a competition judged by Wildlife World and Simon King, TV cameraman and naturalist, pupils were asked to design an insect hotel fit for a Queen. The winning design was chosen for its ‘combination of a striking design with practical elements’. Congratulations to the winner, Rose Austin from Hempstead Junior School in Gillingham!